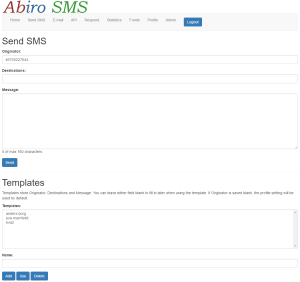 SMS Gateway (externally called Abiro SMS) provides means to send SMSs via e-mail, API and from an on-site form, supporting white-listing of e-mail domains and addresses, creation of any number of templates for SMSs containing originator, destination(s) and/or a message, that are easily called up etc. SMS Gateway is still in alpha, but is used commercially on a per-customer basis. SMS Gateway was developed by Abiro. Development started March 2017 and the first stable version as per above was ready during that month.